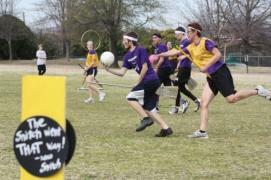 Being a fitness fan, of course, one of the things that always intrigued me about Harry Potter was the sport Quidditch. The game once reserved for students of Hogwarts School of Witchcraft and Wizardry (for all you non-Harry Potter fans, this is the school that Harry and his pals attend) has made its way to the muggle (translation: non-magical) world. In fact, it's quite the trend: More than 2,000 athletes will participate in this year's Quidditch World Cup, taking place in New York City on November 12 and 13. The Northeast appears to be the hot spot for what the International Quidditch Association (IQA) claims is "the fastest-growing sport in the United States." According to the IQA, the most registered teams hail from New York (39), Masschusetts (22) and Pennsylvania (20). But "28 states and counting" have Quidditch teams, many of which are connected to colleges. Each team consists of seven players: one Keeper, one Seeker, two Beaters and three Chasers; of course, there is also a Snitch who is a neutral player. With feet firmly on the ground, as opposed to the high-flying version they play at Hogwarts, Quidditch becomes a combination of rugby, dodge ball and flag football. We spoke with Troy Stanford and Winter Schwaid-Lindner of the IQA to find out how to get fit for each position. How to train: Chasers are comparable to soccer players. The position involves plenty of running, but is also very physical, so muscular legs and a strong back and core are essential. “Chasers should swim to help build core and back muscles. Cycling is also a great Chaser exercise to help build leg muscle,” Stanford says. Keepers: block goals into the three goal hoops from the opposing teams chasers. Beaters: protect teammates from objects thrown by the opposing team that are meant to knock them off course; throw these objects at the other team. How to train: “Beaters are one of the least physical positions of the game, but they should mix Keeper and Chaser training for the best results,” Stanford says. Powerful arm muscles are imperative for this position because it requires accurate aim. “The Beaters have bludgers (slightly deflated dodgeballs), and they throw them at other players to get them out,” Schwaid-Lindner adds. Snitches: avoid capture by either team. How to train: The Snitch position requires the widest range of training. According to Schwaid-Lindner, the snitch is “ideally an attention seeking cross country runner with some background in wrestling and gymnastics.” Not sure how to train for that? Try some cardio-kickboxing, Tai Chi or even capoeira classes. Seekers: try to catch the snitch. How to train: “Seekers should run as much as possible since their only job is to find, chase, and catch the Snitch,” Stanford says. He also recommends a combination of swimming and weight training to help with the capture of the Snitch, who does whatever she can to avoid being caught. For more information on the rules of Quidditch and how to get involved, visit the International Quidditch Association website! Now tell us: What character from Harry Potter would you most like to join you during your next workout?